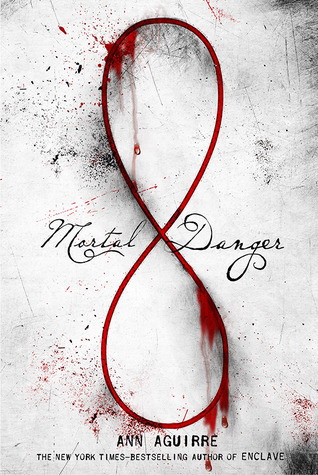 When I first saw the cover of Mortal Danger, I knew I'd have to read it. That combined with the synopsis and the fact that I absolutely LOVED Ann Aguirre's Razorland trilogy (highly recommended, by the way) sealed the deal for me. I ended up picking it up on audiobook (which was actually how I read the Razorland trilogy too...) and that was definitely a good decision! Mortal Danger is definitely unique - I'll give it that. Edie is an outcast and she's pretty much done with everything. The book begins with the shock of Edie on the verge of committing suicide. But she's saved in a very unusual manner and is basically given three wishes. Unfortunately, Edie's first wish was kind of a turnoff for me. The entire central them of this book is beauty. Edie's wish is to be beautiful and I just really can't figure out exactly how I feel about it. Of course everyone has something they'd like to change about themselves - even me! If I had three wishes, I might use one of them to fix something about myself, sure. I could have been totally on board if her issues were things that she couldn't have done anything about. But none of Edie's problems were things that she couldn't have changed about herself and that's what bugged me. She didn't like her weight? Okay, so stop eating junk and go to the gym. She didn't like her glasses: get freaking contacts! I don't want to go so far as to say this book tells girls they can't do anything about their body image problems and to call it quits, but it kind of leans pretty far in that direction. I mean, she's about to kill herself over it when the book starts. From that point on, the book revolves around how beautiful everyone, including Edie, is (and she sure gets over all of her self-esteem issues in a hurry once she's pretty). That aside (but that's a pretty huge aside), this was a pretty good book. I actually did like Kian. I liked his honesty and the way he seemed to regret Edie changing herself. The romance between them seemed genuine, though I can see how some people might think it's slightly insta-lovey. I'm sure that probably had something to do with the fact that Kian had been creeping on Edie for quite awhile before they met... The other relationships in the book were about the same. Honestly, all of the character interactions were just meh for me. The concept of the game between immortals was certainly interesting and I feel like it had a lot of potential. The bad guys were super creepy for sure! Especially the Bag Man - he was straight out of a creepypasta! There were definitely some moments that had me on the edge of my seat. Mortal Danger is full of suspense and the creep factor is there. It just didn't do it for me... And that makes me sad. As always, everyone will obviously have differing opinions when it comes to certain topics. This one just didn't sit well with me, although plenty of others will have no problem looking right past it without a second glance! I loved Ann Aguirre's Razorland series and will not hesitate to read any new series she puts out, but I don't think I'll be finishing this one. It did have some good qualities like the horror and originality, but there were too many negatives that outweighed them. Susan Hanfield is an amazing voice actor!! Her narration skills really saved this book for me. I'm not sure I would have finished it had I been reading it on paper. Susan has unique voices for each of her characters and made the scary ones truly terrifying. I'll definitely be on the lookout for other books read by her!